The LTA is proud to be supporting Judy Murray’s Tennis on the Road programme which is a stand out programme that aims to inspire coaches, children and parents to get involved in and stay in tennis. Judy’s innovative coaching style and content gives everyone involved a great introduction into the basics of tennis in a fun and engaging way that in no time at all helps them to master the fundamentals of what can at times be seen as a complicated sport to play. With progressions to help every player improve in the same innovative environment TOTR is a proven programme for getting more and more people into our great game. Along with our Partners at Tennis Scotland we are looking forwards to supporting the TOTR roadshow over the course of the next two years initially to communities all across Scotland to ensure that everyone who gets to experience this great programme first hand has the opportunity to continue to play in a safe and welcoming environment in the future. 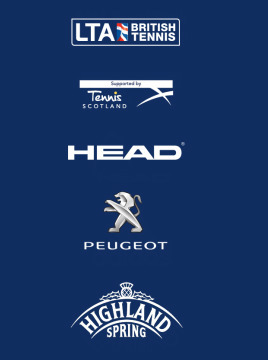 Peugeot were delighted to come on board as a partner and official vehicle supplier to Tennis on the Road. It is hoped that the addition of a dedicated van will allow Judy and the team to cover even more miles and visit even more corners of Scotland to help increase the coaching workforce and grow the game of tennis. Highland Spring, Britain’s number one plain bottled water brand has been a proud supporter of the Murray family for many years. They are looking forward to helping encourage the next generation of tennis players to get involved in the sport through Tennis on the Road. As a long-term supporter of British sport, Highland Spring is committed to getting more families and children to adopt better hydration habits and take part in active sport. RBS helped to launch Tennis on the Road in October 2014 and supported the programme for the first two years of delivery. They continue to be a long term supporter of the Murray family.